If you’re not exfoliating, you’re missing out. Exfoliants remove all those dead cells that make your skin look tired, dull, and old, giving your face a brighter and healthier look. But, not all exfoliants are created equal. There are two types: chemical and physical exfoliant. And, one type is way, way better than the other. They dissolve the “glue” that holds skin cells together, allowing them to fall off. They can also dissolve the dead skin cells themselves. Which ingredients do they use? Salicylic acid: reduces breakouts by exfoliating the pores from within, so it’s most suitable for oily and acne-prone skin types. They can cause irritations if used too often. They mechanically remove the dead cells on the surface of the skin. These little particles can have jagged edges that can scratch and tear up skin. Apricot kernels are the absolute worst. Avoid! Plus, they may not exfoliate evenly. If you scrub your chin for 2 minutes and your cheeks for 2 and half, your skin will be more exfoliated in some places than others. 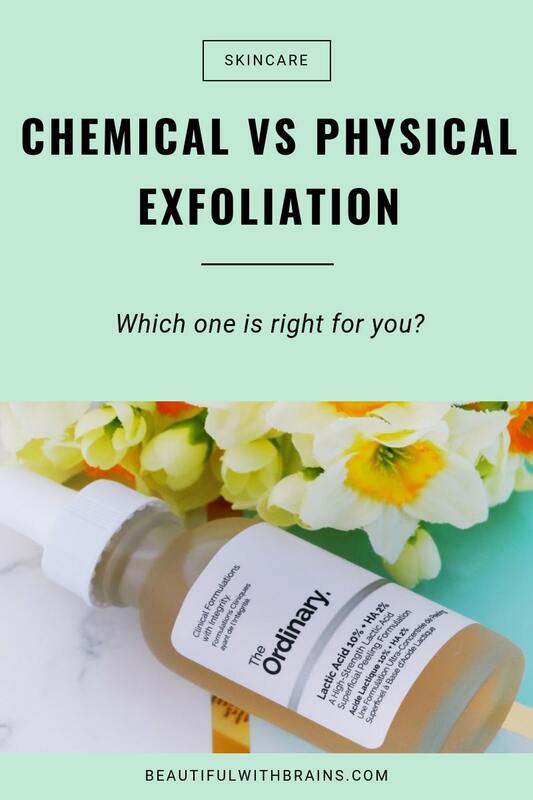 Chemical VS Physical Exfoliation: Which Type Is Best? Chemical exfolition all the way. Why? It’s less likely to irritate skin. Chemical exfoliants also do other stuff like hydrate skin and boost collagen production. Seriously, who said that chemical is bad? What do you think about chemical vs physical exfoliants? Let me know what your fave type of exfoliant is in the comments below. I stick with mostly chemical exfoliants for my dry skin! Jamilla, I prefer chemical exfoliants too. They are very effective. Wow, I never knew that there’s a difference between both exfoliants. Funny thing though, I’m using Hada Labo AHA & BHA Gentle Exfoliating Wash but I keep on getting pimples. I’ve never been allergic to any ingredient before, even salicylic acid. Addy, is that a rinse off product? Cos AHAs and BHA need to stay on the skin to work, if you wash them off they just won’t do anything which may be why you’re still getting pimples. I know some experts recommend massaging face washes into the skin for a minute to enhance the effects of exfoliants before you rinse them off but I’m not sure how effective that would be either. 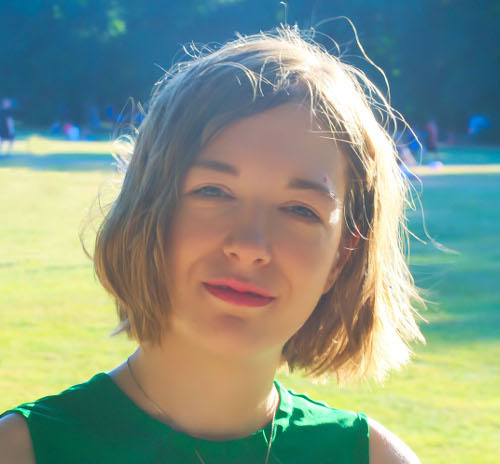 Imo, if you’re going to use either AHAs or BHA (or both), you should buy leave-in products to get the most out of them (and your money). ah thanks for the heads up! yes it’s a rinse off product. guess need to get a leave-on treatment then. I prefer physical exfoliants. For some reason, my sensitive skin isn’t too happy with the chemical variety. Trisha, sensitive skin needs time to get to chemical exfoliants, especially if the concentrations of the active ingredient is high. But a washcloth is a great alternative for sensitive skin too. Physical exfoliants work well too as long as they don’t have rough particles that tear up skin. This was a great post! I always thought for some reason that a chemical exfoliant was harsher than physcial probably because of the “chemical” connotation but it makes so much sense now. I use both. I have been using glycolic acid (MD Formulations cleanser which is great btw) but I will now consider a salicylic base for the next time as I am prone to blackheads. I do love the dermabrasion physical exfoliant from Kiehls…it is strong, so as long as it is not used with a firm hand, it has been THE MOST supereffective physical exfoliant I have used. A personal tip, I find the main thing in exfoliating is to spend longer exfoliating but gently….instead of a quick and hard scrub and rub. I find my skin (cells) needs quite a bit of time to soften up, before they can even be sloughed off. Doing it this has way has been noticeably effective. Wendles, it is such a shame that the word chemical has acquired such a bad connotation. It is more and more commonly used to describe synthetic ingredients (which are perfectly safe and effective anyway), when the word means everything that’s made up of matter. That includes water, plants, pretty much everything..
I’m glad the Kiehls exfoliator works well for you. And thanks for the tip. I agree, especially for chemical exfoliants. They need to stay on the skin to work. If you scrub skin really hard or for too little time, the results won’t be as good and may even irritate skin. Xin, I know what I mean. 😉 I can’t give up physical exfoliants for good but I prefer chemical ones too. I think they are more effective and gentler. I have both 🙂 I know that chemical exfoliants are better, but sometimes there’s this physical need to really give my face a good scrub. I use Soap & Glory’s Greatest Scrub of All. It’s got salicylic acid so perfect for days when I really need to feel “clean”. I use a physical exfoliant (sugar) at the moment. I think it works better for me, probably because of its granules. Amanda, sugar is a great exfoliant. I sometimes use it in a paste to scrub my lips. Great post. I use chemical exfoliants but like you still love the feel of a physical face scrub. Christina, thanks. I think chemical exfoliants work better in the long run, but sometimes it feels nice to use a physical one too. I have found oatmeal is the best physical exfoliant because it has healing and calming properties and it is natural/cheap. Amy, I like oatmeal too. It works really well and is so cheap! I use a salicylic acid mask, but I think I’ll go the washcloth/baby brush route since the SA one leaves me flaky. Ana, I’m sorry the SA mask doesn’t work for you. A washcloth is my fave type of physical exfoliant as it is really gentle and can be used every day. Just one thing to say… Your posts are always so informative !!! Ruth, oh thank you! So glad you find them useful. Recently I been using oatmeal to cleanse my face morning and evening , I also apply BHA 2% of PC’s along with Pore Targeting Treatment of Proactive Plus , do you think I am over-exfoliating my skin ? Look forward to hearing from you 🙂 ! Hoang, the combination of BHA and benzoyl peroxide can be too strong for some people. If you didn’t have any problems with it so far, then your skin may be able to tolerate it. But I would either pick one or use them on alternate days. can you give me examples for natural exfoliants? Reham, sugar and apricot kernels are natural exfoliants, but they’re not very good and could irritate skin, too. When it comes to exfoliation, chemical (with glycolic or salicylic acid) is much better. I agree that chemical exfoliant a are so much better for your skin than abrasive scrubs! I use an AHA overnight lotion from derma e that works wonders, and I’ve overcome my distrust of toners to embrace pixi glow tonic, but when I just need to have that strangely productive feeling you get from physical exfoliation (it just feels like you’re really accomplishing something; just spreading a lotion or gel on your face and leaving it doesn’t have the same effect), I use a gommage peel. They’re not so polar in the US but I was introduced to them when I was living in Tokyo. You spread a gel over your skin, leave it for a few minutes, then massage it in circular motions. The gel rolls up into little balls and takes all you dead skin with it. It’s so fun it’s almost addictive, plus it’s way less harsh than most other physical exfoliants. I highly recommend trying a gommage! Ugh, please forgive the typos. My phone is not cooperative. Thiel, if only using chemical exfoliants were so satisfying as using a scrub! There is something about seeing all that dead skin come off that’s really addictive. Too bad they don’t do skin any good. Gommage peels are a better alternative indeed. Thanks for pointing that out.